For some, you may not know the name Kronos Quartet. I hope that isn't the case but its possible. Kronos Quartet are a classical ensemble that has been together over 3 decades now. You could say they are single-handily responsible for bringing a "punk" ethic to genre and expanding it to younger generation. The "punk" ethic that I'm referring to is Kronos Quartet's choices of daring repertoire. They have performed the music of John Zorn, Jimi Hendrix, David Grisman, Ornette Coleman as well the more avant garde classical composers like Philip Glass and Alfred Schnitke. They have recorded over 40 albums so it does become a daunting task for someone to find the right album to start with. For me, it was Monk Suite (Landmark Records). I first heard it in of all places--a record store! I thought it was the coolest thing I heard to that point. For a few minutes I couldn't place the songs. And then I realized it was Thelonious Monk, but I couldn't understand who would turn this songs into classical music. Was this some sort of joke? Like when Devo did their Muzak album? (I hope some of you get that reference. Please tell me you did?). I asked the clerk at front what was playing and she showed me the album. All I could say was--wow! I hadnn't heard of Kronos Quartet to this point. Monk Suite features some very familiar Monk pieces including, "Well You Needn't," "Round Midnight," "Crepuscule With Nelle" among others. The tunes are not that different from the originals but it is honor and spirit to which the recordings are done that makes this so special. The performances have a fun and vibrant quality to them that is both beautiful and endearing. The quartet is also joined by legend jazz musician Ron Carter on bass. Carter's contribution gives these pieces an additional depth and foundation for which the non-classical, non-jazz listener can easily enjoy the experience. 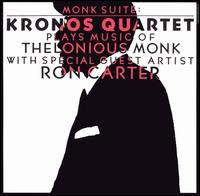 Kronos Quartet also recorded another jazz themed album or Bill Evans material but I believe the Monk Suite is probably the most accessible of all the Kronos releases. Monk Suite may also be a nice way to get yourself into both jazz and classical without feel overwhelmed. If you do pick this up there is also a compilation called Released 1985 - 1995 (Nonseuch) that covers a good majority of their classical repertoire that is well worth owning. Kronos Quartet have and continue to expand the view of classical music by consistently performing new and challenging material. They unfortunately haven't revisited jazz in the complete context as the Monk and Evans albums but they made an indelible mark with these recordings and set a benchmark for other string quartets and classical ensembles to deconstruct and reinterpret contemporary/modern music with great vision.